A lorry driver has been fined £12,000 more than two years after 20 migrants sneaked on board his truck. Dave Edmunds, from Dudley, alerted authorities to the stowaways when he felt them move as he waited at the Calais port. He said the fine could put him out of business and has appealed against the decision. The Home Office said penalties were only imposed when drivers fail to have an effective protection system. Mr Edmunds was transporting bread dough in a refrigerated trailer when he parked up overnight almost three hours away from Calais in September 2016. He said the stowaways "tampered with a lock" and then "disguised" it with grease after entering the trailer at around 05:00 BST. Mr Edmunds said he alerted dog handlers at the Calais port as prepared to depart for Britain. "It was me that alerted the authorities to their presence. I'm shocked. Why should I be fined?" Mr Edmunds said. "I will possibly lose my truck or even worse my house to pay it." The Home Office said Mr Edmunds was notified of his potential liability for a penalty at the time and said the fine delay was down to restructuring within the Border Force. A spokeswoman added: "A penalty is only imposed when a driver or company fails to have an effective system to protect their vehicles and anyone issued with a fine has the chance to lodge an objection." 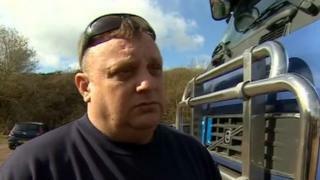 A Telford trucker previously won his appeal against an illegal immigrant fine.